The hand-written family history provided by my great-grandmother, Jesús García de Alvarado (1871-1966), has proven invaluable in building out the Alvarado line of my family history. At the same time, it has presented some conundrums. This article proposes a theory of our Alvarado lineage back to the Spanish colonial era, seeking to reconcile church records of Sinaloa with the holographic family history of my bisabuela. To set out this theory I focus on five main points, all depicted in the preliminary lineage documented in the accompanying tree to serve as a framework for continuing study. The first important data provided by this written history of Jesús are the names of my great-grandfather José Maria‘s parents and siblings, in birth order. The story that grounds this family history is about my great-great-grandfather Fernando and how he came to live in Sinaloa. There he found his wife, “la unica hija que tenia el Señor Frias Asendado de Pueblo de Chametla.” To this she has added in the margin “(Eugenia) Eufemia.” In my mother’s bride book, she had carefully noted the name of her great-grandmother as Jesüs told her: Eugenia Frias. This is the first issue to deal with. However accurate many other aspects of the story are, Eugenia’s surname does not appear to be Frias (although that may be a name further back in the maternal line; Jesús consistently gave her own “maiden name” as Verdugo, her maternal grandmother’s surname). At the right time and place, however, I discovered a couple that is almost certainly the parents of José María. According to the birth certificate of José María Alvarado, born 20 November 1862 in Agua Caliente and baptized in Villa Unión, Sinaloa, his parents are given as Fernando Alvarado and Eugenia Tamayo. Both of these places were then in the municipio of Mazatlán, and José María always gave Mazatlán as his place of birth, although he also insisted he was born 21 November 1866. Given the difference in birth date and surname of the mother, however, this might seem to be a shaky assumption. But what if Fernando Alvarado and Eugenia Tamayo had children with the same names and same birth order as given by the handwritten history by Jesús? 1. Francisco. “El mayor Francisco muy parecido en todo a el, era su retrato luego.” Francisco Policarpo Alvarado, son of Fernando Alvarado and Eugenia Tamayo, was baptized in the church at Rosario 25 January 1841. (not listed) María Telesfora Alvarado, daughter of Fernando Alvarado and Eugenia Tamayo, was baptized in the church at Rosario January 1842. It is likely this child died young, and so José María may not have even known about her. 2. Teofilo. 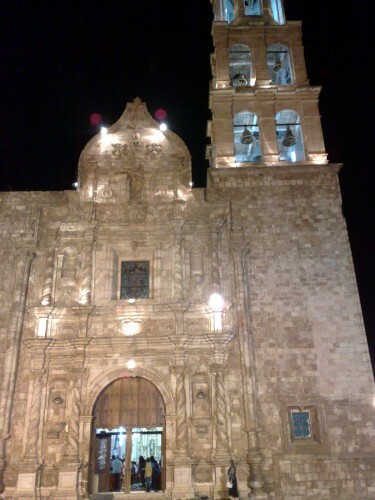 On 22 November 1870 Teofilo Alvarado, age 21, son of Fernando Alvarado and Eugenia Tamayo, was married to Rosario Urena in the cathedral at Mazatlán. 3. Manuel. No records found. 4. Brigida. “Brigida se caso con el unico hijo del Dr Domingo Vidal, y Jesus caso con la hija Catalina. Domingo y Catalina hijo y hija del Dr Vidal.” María Brigída Catalina Alvarado, daughter of Fernando Alvarado and Eugenia Tamayo, was born 25 June 1855 and baptized 1 July 1855 at the church of San Juan Bautista in Villa Unión. Even more convincing is that border records exist of her as the wife of Domingo Vidal, as described in the story, as well as records of the children listed by Jesús. 5. Dolores. No records found. 6. Jesús. Listed as the next-to-youngest son, but according to other records, such as the 1930 Mexico Federal Census, he was born in 1867, one year after José Maria. Jesús Alvarado, son of Fernando Alvarado and Eugenia Tamayo, married Catalina Vidal on 21 September 1890 in the cathedral at Mazatlán. She is the sister of Domingo, as related in the story by Jesús. 7. José María. “Francisco y Jose Maria se parecian al papa.” See above. 8. Mercedes. No records found. For me, the linkage of the children as described in the handwritten family story conclusively proves that Eugenia’s surname before marriage was not Frias, but Tamayo. She was baptized in the church at Chametla on 22 September 1822 as previously noted, the daughter of Francisco Tamayo and Maxima Villalobos. I have no further records of them as yet, but am betting that one of Maxima’s or Trinidad’s parents or grandparents had a surname of Frias. Ideally there would be a marriage record for Fernando and Eugenia that would give their parents and perhaps also their birthplaces, ages and grandparents. Sadly, there appears to be a gap in the records of the church in Rosario, where they were probably married, for the time when they would have celebrated their wedding, probably about 1840. And I have not found a record of their marriage in Chametla. According to Jesús’ story, Fernando was born in 1810 in San Francisco, and had a son Fernando, also born in San Francisco. However, there is no record of a Fernando Alvarado in the 1775 or 1790 padrones (Spanish censuses) of Alta California, nor in the 1842 padron of San Francisco, nor in any of the mission records as contained in the database of the Early California Population Project of The Huntington Library or the fragment records of the 1850 California census (the botched first U.S. Census of the new state), or the 1852 state census re-do. However, José María Fernando Alvarado, son of Don Manuel Fernando and Doña María de Dolores Olaeta (they were married in Rosario 1 August 1809), was baptized in the church at Rosario 17 August 1811. He was born in Rosario on the 15th. Is this really our Fernando? Remember we have no marriage record giving the names of José María’s parents. But we do know the name of Fernando’s younger sister: Brigida. And Don Manuel Alvarado and Doña María de Dolores Olaeta had their daughter María Brigida baptized in the church of Rosario on 10 October 1816. There were two additional children of Manuel and Dolores. María de la Paz Pasquala was baptized 16 May 1810 and Juan Pablo was baptized 26 January 1815, both in Rosario. Yet Jesús stated that Fernando was an only son. It is entirely possible that Juan Pablo did not survive. Remember that child mortality was extremely high; even José María and Jesús lost four of their seven children after moving to Los Angeles. Jesús wrote that Fernando was 18 years old and Brigida was 15 at the time of the fateful ocean journey. That would make the date of the trip about 1829, and Brigida would actually have been about 14. Pretty close. Note also that in this generation we see baptismal and marriage records referring to the Alvarados and related families using the honorifics Don and Doña. This would seem to corroborate what Jesús wrote: “Sr Alvarado tenia una hermana casada con un alto empleado de Gobierno de Mex,” “Sr. 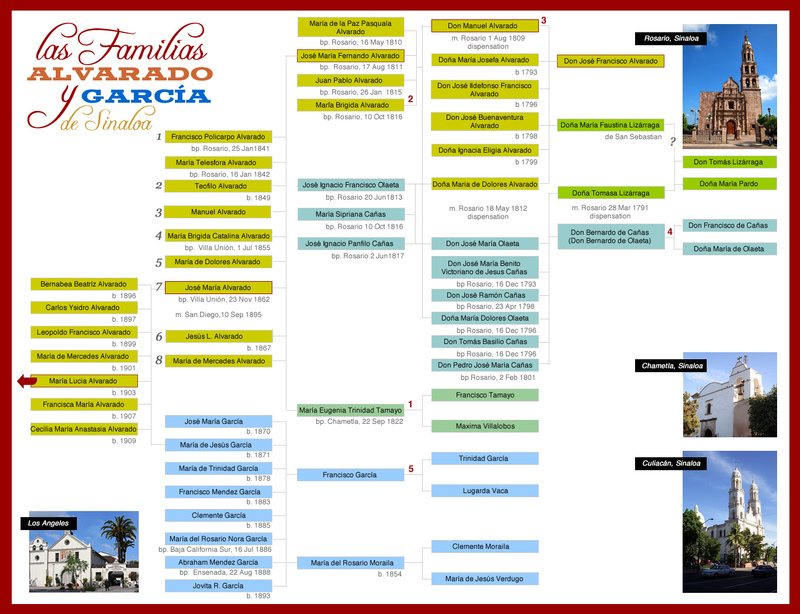 Alvarado had a sister married to a high government employee of Mexico.” Notice that three of the marriages required dispensations due to close family relationships between the Alvarados and the Cañas/Olaeta and Lizárraga families. This seems to indicate wealth-preserving alliances. Additionally, it is strange that none of José María’s siblings were named Fernando. However, the fact that this Fernando was also named José María immediately solves this puzzle; Fernando’s namesake was my great-grandfather. There is ample evidence to believe that the grandparents of José María were Don Manuel Alvarado and Doña María de Dolores Olaeta, and that his father Fernando was born in Rosario. As noted above, it may be that Fernando was not born in San Francisco, and that his father was not named Fernando, but Manuel. Does this require that we discard the story of the fateful journey of young Fernando and Brigida from San Francisco to Sinaloa? Not at all. To begin with, no baptismal record has been found for Don Manuel. He could well have been born in San Francisco. Additionally, there is nothing to suggest he could not have moved to San Francisco after the birth of Brigida in 1816. That would explain his absence from the 1775 and 1790 padrones of Alta California. It is also significant that Fernando named one of his sons Manuel and another Francisco, probable tributes to his father and grandfather. Fernando’s mother, Doña María de Dolores Olaeta, appears to have been part of a prominent family in Rosario. However, there is some confusion as to their surname. Her father was Don Bernardo de Cañas, who in some records has a surname of Olaeta. His parents were Don Francisco de Cañas and Doña María de Olaeta. He married Doña Tomasa Lizárraga in Rosario on 28 May 1791. Don Bernardo’s children are also variously known by the surnames of Cañas or Olaeta; a baptismal record may give one name and a marriage record the other for the same individual. More research is needed to understand the nature of the family’s prominence in Rosario and why the two names were used so interchangeably. It might be noted for reference that the Cañas River separates Sinaloa from Nayarit. Family oral history, no doubt handed down by Jesús, whose credibility is well proved, is that her father Francisco García was a Basque soldier named Vasco or Bosco brought to Mexico by the French who assumed the identity of a dead soldier he found on the battlefield of the Battle of Puebla — or some other conflict of the French Intervention in Mexico. 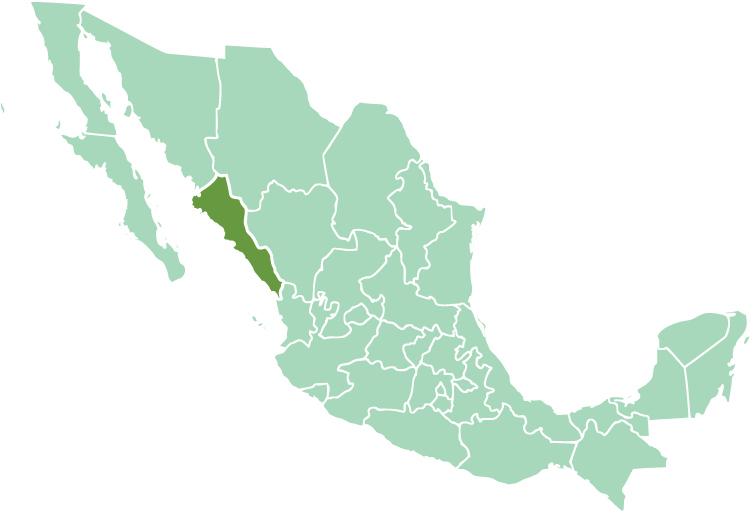 The Battle of Puebla, which is commemorated annually on May 5 (Cinco de Mayo), took place in 1862. Assuming that Francisco married María del Rosario Moraila around 1870, shortly before the birth of their first child José María “Chema”, at the customary age of about 20, he would have been about 12 years old at the time of the Battle of Puebla. While there were no doubt very young Mexicans defending against invaders at Puebla, it is unlikely that the French would have brought over a boy of 10 or 11 as a mercenary. The birth record for the third son of Francisco and Rosario, Abraham Mendez, plainly gives Francisco’s birthplace and the names of his parents, stating Francisco was born in Michoacan de Ocampo and his parents were Trinidad García and Lugarda Vaca of Culiacán. Vasco in Spanish means “Basque.” So this is most likely not his actual surname; in Spanish the family story was probably related as “su apellido era vasco,” i.e., “his name was Basque” and this was lost in translation to English. However, the story about Puebla need not be discarded, for it could be about Francisco’s father, Trinidad. I have been unable to find any other records of him, so this break in records could well be accounted for by his being a Basque mercenary at Puebla who assumed the identity of a dead soldier named García. So what was Trinidad’s original surname? The names of the children of Francisco and Rosario carefully pass on the names of three of four parents: Trinidad, Clemente and María de Jesús. Why was Lugarda neglected? Perhaps an as-yet unknown child who bore her name died, or perhaps they intended to get around to naming a child after her but never did. So it’s odd that two of their children, Francisco and Abraham, both have an unusual middle name: Mendez. Could this name be a clue to a hidden family legacy left by Francisco and Rosario? I was interested to happen onto your site. I’ve been involved in Alta California families in the Bay Area for some years. The Contra Costa County Historical Society contains a genealogical collection from one of the most extraordinary, obsessive, collectors of documentation on Californianos that I’ve seen. I’ll bookmark your site, so that when I have time, I can see what she has on your Alvarado family. In all likelihood, Francisco Tamayo’s complete name was Fco Tamayo Frias, or Fco Frias Tamayo and that my grandmother, Jesus, confused his matranymic with his patronymic. Great research anyway. Your assumptions are valid given the dates of existing documents. Didn’t the Vidal branch resettle in San Francisco? Keep up the research. Will regale you with documents from your mother’s childhood, if you wish, including a sample of her very first signature. Eric, did you realize that you have information regarding living persons posted on this site?? Sir: My name is Ricardo Alvarado III, I live in Cd. Juarez , Mexico. Just a few hours ago I was informed by an aunt that my great grandfather’s last name was Fernando Alvarado Ureña, so I googled it and I found your blog. To my susrprise it was my own family!!! my great grandfather married a woman of jewish/german ancestry Elena Newman , they had to boys Alfonso and Ricardo. I was told that she was jewish because her father’s name was Moises or Moses Newman or Niverman. They where. Married in Villa Union, Sinaloa. Ricardo, nice to hear from you! I’ve sent you an email.